Any of the many fragile insects of the order Ephemeroptera, that develop in fresh water and live very briefly as winged adults. 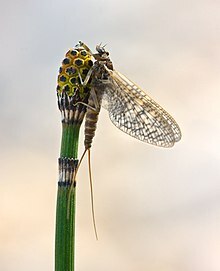 Adult mayflies have large compound eyes and most have two pairs of wings. […] Mayfly nymphs are distinguished by their three tails (two cerci かつ a terminal filament) and the set of gills on each side of their abdomen. Mayflies are fragile, gossamer-winged insects that arise from bodies of water and often swarm in great numbers. Stoneflies have negligible consumptive (thin solid line) and behavioral effects (thin dashed line) on mayfly abundance. Consumption by trout decreases the abundance of mayflies (solid line), but trout suppress mayfly emigration (drift) and thereby increase their abundance (thick dashed line). In some English dialects, the alternative plural form is "mayfly". For exampleː While some animals take months to reproduce, mayfly need just one perfect day.